Discussion in 'Runner' started by HeyItsAdam, Dec 4, 2018. 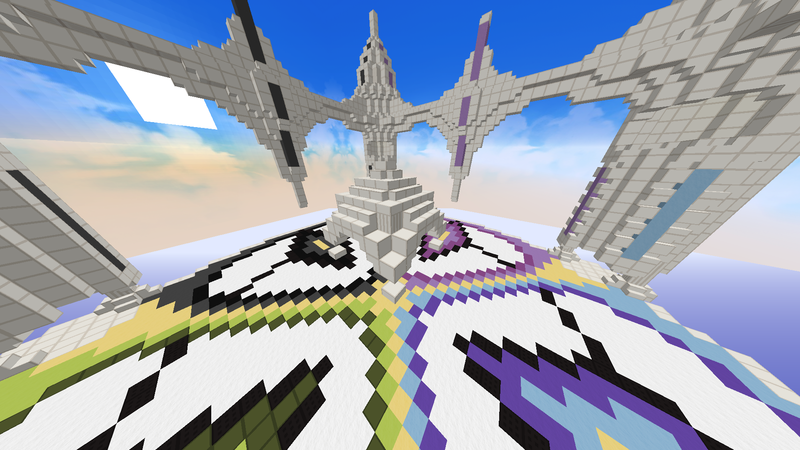 Cloud City is a relatively older Runner map on Mineplex. It consists of two levels, the bottom one being smaller, with a wall-like structure along the perimeter. Perhaps one of the more notable features on this map is the 'temple' located above the top layer of blocks, in the center of the map. As far as I'm aware, this has always been a part of the map. It appears to be an aesthetic for the map at first glance, until you realize it actually can be used in game play, and that is the issue with it. You are only able to get up here by using leaper kit. A kit exclusive area of the map, where it's impossible to reach if you are one of the other two kits (unless you're hacking lol). I don't know about others, but I personally dislike this a lot, it gives leapers a place to camp away from other kits (and a lot of other leapers who do not know about it), which I consider an unfair advantage with this kit on this map. I've timed myself before, and you are able to stay well over a minute up here uninterrupted. "an archer would just shoot you down lol" - This has never happened to me. I really don't think archers would be paying more attention to your position up high more than where they are running themselves. "set a border so they die when they try to leap up" - I don't want players to have to die a foolish death just because they tried to leap up to what appeared to be a spot on the map that seemed okay to get up to. "it can't be that bad lol" - Seeing how long it has been in the game with not a lot of complaints, no, it is not a gigantic issue, but that does not mean change can't come to it. I still see it as an issue, just not such a large one. All kits should be able to use the same blocks. With all this said, I believe the best course of action is to simply remove the structure. It could be countered, yes, but in a not so easy way, and you would still be unable to reach it without leaper nevertheless. At the end of the day, it's a camping spot for leapers. Wiz_Techno, Sophie_OGrady and MrDrProfessor//_Prof_ like this. Honestly don't see a reason to why we shouldn't fix this. With all of your current points you are literally correct on almost every one, and I totally agree with you. There shouldn't be any points of the map to where players could have an unfair kit advantage over the other players. Like you said, you could just shoot them down with the Archer kit but at the same time it's still unfair to people who aren't equipped with Archer Kit, so I don't see a legitimate reason as to why we shouldn't at least block off a kit exclusive area (or just get rid of it). I don't have much to say about this but definitely just a +1 from me to get rid of the structure at the center. MrDrProfessor//_Prof_ and HeyItsAdam like this. You're making fair points, there are many reasons to fix this. The last time I was up on top of the temple, I was actually on there for 3 minutes. I main leaper kit and the temple above rigs the game in favour of leaper classes because they are the only kit that can get up there. I hope to have this map taken down first, and then come back when the temple there is either up higher to get out of reach of leapers or just straight up removed. Though, it didn't glitch for me, my frame rates were just fine. After some consideration, I am willing to remove the center structure. Feel free to PM me if you have any other concerns/suggestions. Thanks! HeyItsAdam, MrDrProfessor//_Prof_, Shaiym and 1 other person like this. Clay Plaza also has several structures like that that give leapers a big advantage, although i kinda like that since i use leaper. I was considering to bring this up too, though I decided to just focus on this one. That one is objectively much easier to get players off of, but it is still an issue in my eyes due to my other reasons I mentioned here. Perhaps I could make another thread on it.. probably not.